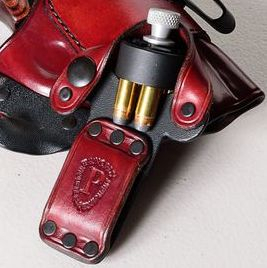 The main benefit of a winged mag carrier over a single loop is how high it sits on the belt. A single loop is typically sewn at the bottom of the scabbard. This requires space for the stitch so the unit must sit lower on the belt. Single loop scabbards can loose tension and be less comfortable than a double loop carrier depending on your build and where they're placed on the belt. 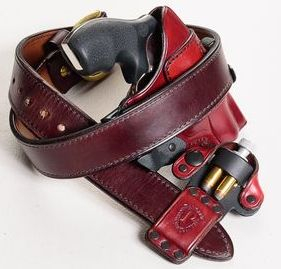 The double loop are also slightly easier to conceal as they ride no lower on the belt than a typical IWB holster. Most double loop scabbards take up more space on the belt than a single loop. Panoply scabbards are built on a bias - the outer piece of leather is larger than the inner one - reducing the amount of belt space needed. 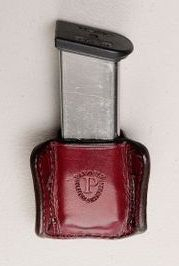 The same system used for the Panoply Double Winged Magazine Scabbard. 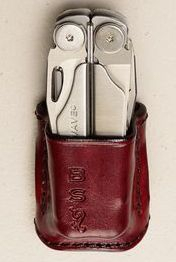 Each carrier is built to friction fit the individual Leatherman, flashlight, or like tools. Today's market has provided a great variety useful multi-tools, flashlights, etc. Panoply continues to grow its collection, but it seems like we're always missing your item. 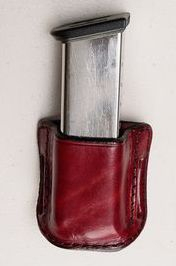 If we don't have it, we will be happy to make a scabbard if you send us the tool. Anyone who's used a revolver knows they are slow to reload without a speedloader. Anyone who's carried a speedloader knows they're awkward to conceal. 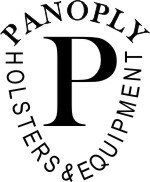 Panoply has taken advantage of Kydex and leather to create a slim, comfortable, easy to conceal tool that allows an unencumbered deployment of your speedloader. A "Pull the Dot" one way snap is used to secure the speedloader. The Carrier comes with one of two length straps. The .38/.357 length works on all HKS five or six shot loaders. The .44/.45 works with magnum, special, or Long Colt rounds.